The 2019 Nigerian general elections are scheduled to take place on 16 February 2019 to elect the President and the National Assembly. The elections will be the country’s sixth since a democratically elected civilian government took over from military rule in May 1999. There are in excess of 70 political parties that have chosen candidates to stand in the upcoming elections; however, polls indicate the final result will come down to a two party contest between the incumbent President Muhammadu Buhari of the All Progressives Congress (APC), and Alhaji Atiku Abubakar of the People’s Democratic Party’s (PDP’s). The election stakes are high, with the winner taking power of Africa’s largest oil producer amid a multitude of security challenges. Expectations for a peaceful, transparent election are also of great importance following Buhari’s election in 2015 which was described as a rare peaceful transfer of power. On 18 January, the US State Department issued a warning regarding an increase in terrorist propaganda surrounding the elections. The security alert reported “ISIS West Africa (ISWA) and Boko Haram have both stated they plan to disrupt the upcoming 2019 presidential elections by conducting attacks on Nigerian security and infrastructure, as well as places of gathering such as markets, hotels, and malls.” Despite the warning, there is no current intelligence indicating a specific threat exists aimed directly at polling stations or locations associated with the election process, although a significant increase in security is expected. Nigerian President Muhammadu Buhari has suspended Walter Onnoghen, the country's top judge, over multiple allegations, and this has increased concerns over the whole Nigerian election process. The move is claimed by opposition parties as a tactic to increase Buhari’s chances of remaining in power, as the judiciary is expected to play a significant deciding role if the results of the country's upcoming presidential election are disputed. One of the key differences between this upcoming elections and the 2015 elections in which Goodluck Jonathan, a Christian from the minority Ijaw ethnic group in the South, was defeated by Muhammadu Buhari, a Fulani Muslim from northern Nigeria, is that the primary opposition candidate Alhaji Atiku Abubakar, is also a Fulani Muslim from the north. As was witnessed in 2015, religion and region played significant roles in determining the outcome of the election result. Goodluck Jonathan was defeated by opposition candidate Muhammadu Buhari by more than 2.5 million votes. However, with both candidates in the 2019 election originating from northern Nigeria, and both Fulani Muslims, much less emphasis will be placed on religion and region, with more focus on the policies and the manifestos of the two parties. The economy is certain to feature heavily, as well as Buhari’s performance over the past three years. Restructuring of the country is also a key factor which could sway voters. The structure of the country’s federation is a contentious issue with many claiming the north to be the more dominant region in terms of fiscal policy. Abubakar, a former vice president of the country from 1999 to 2007, has made a bold move in promising to restructure the country, which might well increase his popularity amongst the electorate in the south. However, exactly how this restructuring will take place remains vague, particularly amid claims he can restructure the country in six months if elected. Security challenges will likely feature prominently in party mandates from both candidates. The threat posed by Boko Haram remains a key issue, with the ongoing terrorist campaign claiming thousands of lives and leaving millions displaced. The promise to defeat Boko Haram by Buhari in 2015 is claimed by the APC party to have been successful with the group “technically defeated”; however, attacks continued with a recent upsurge ahead of the elections. It is possible the group will attempt to use the increased profile of the elections to carry out further attacks and the US government has indicated travellers should keep a low profile “stay alert in public places, including schools, hospitals, government facilities, places of worship, tourist locations, and transportation hubs”. Whilst is remains unclear who will emerge as the stronger candidate during the coming days and weeks, Buhari is known to have a significant following across the north, particularly the northwest. However Buhari is going head to head against a fellow Fulani Muslim from the north for the first time since 2007, when voting amongst northern states was split almost 50-50, amidst an election described by election observers from the European Union as "the worst they had ever seen anywhere in the world", with "rampant vote rigging, violence, theft of ballot boxes and intimidation." Irrespective of the outcome, the challenges and issues currently impacting the country are unlikely to change in the short term. Despite a successful election process in 2015, historically this has not always been the case and there is growing tension amid concerns of renewed violence ahead of polling. Many are hoping Nigeria can build upon the model created in 2015 when for the first time in the country’s history a sitting president was defeated in a democratic vote by the people. Yet there has been increasing frustration amongst Nigerians, including those sympathetic towards Buhari, over the rise in joblessness and poverty, which are assessed as two of the biggest voter concerns, along with growing insecurity in central Nigeria during Buhari’s presidency. This could influence voting and given Abubakar’s edge in garnering support from the south, it is possible we could see a small yet dramatic sway in popularity which favours the PDP party. Given the mounting tension surrounding the elections, which has been further rocked by the suspension of the country's top judge amid allegations of improper financial conduct, there is a growing threat of political protests erupting into election violence. Additionally any indication of voting irregularity is also expected to be met with violent unrest. This in turn would be heavily condemned by the international community monitoring the election process, and could see Nigeria sanctioned as a result, further compounding the economic and social problems within the country. The voter demographic will also play a key part in the election process. The 2019 elections will be the first to include those Nigerians born since 1999, who have never experienced the undemocratic dictatorship rule within a one-party state. It is these voters who will be a challenge to win over and convince who is the best candidate to lead the country within a multi-party political process. Public confidence in Nigeria’s Independent National Electoral Commission (INEC) remains mixed, in spite of the 2015 elections, which were seen as mainly credible. 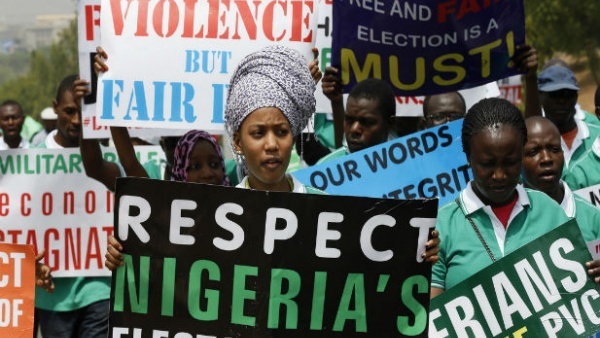 However, there are increasing concerns, both within Nigeria and across the international community that the key differentiators in this election could playout against the aims of the INEC, and any signs of irregularities, or perceptions of irregularities, could heavily increase the chances of election violence in the run up to the national polls.